At BestPriceSkipBins.com.au, we are proud to be able to offer a wide variety of bins that suit all your needs and requirements, whether they be commercial or domestic. We want to ensure that you have a smooth transaction when booking your bin, so our guide to bin types and sizes is specifically designed for you to be able to gauge exactly what you need, and exactly what you’ll get. If you need exact bin dimensions for a specific reason, please get in touch. This is purely a guide as each company does build their own bins differently, however they are all more or less along the same size lines. 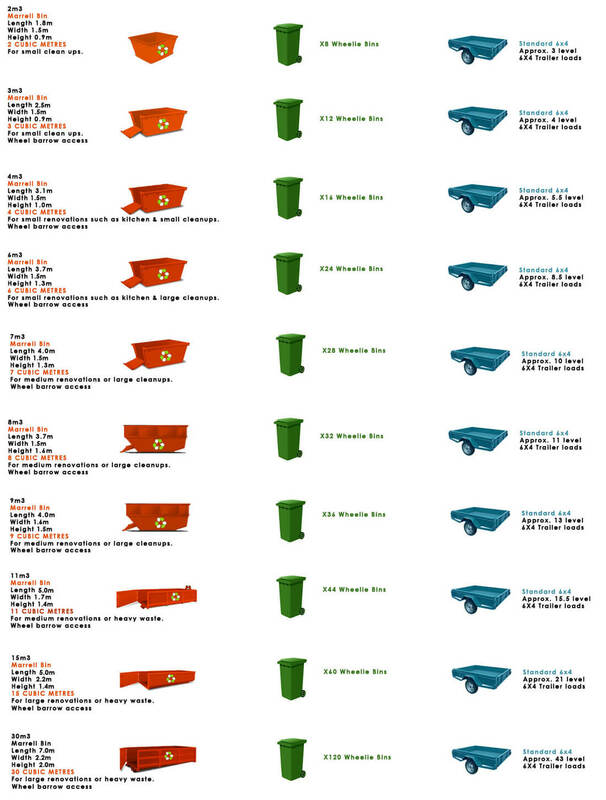 What bin size should you hire? A wide variety of skip bins are available.It’s important to choose the right size to suit your needs to ensure you have a bin that is big enough, or, in turn, don’t spend extra money by booking a skip bin that is too big for your requirements. All Bins May Not Have Doors On Them Please Specify If A Door Is Needed On Your Bin When Ordering. When you think of a skip bin, this is probably the skip that will immediately spring to mind. The most common skip bin on the market, the marrel is used for both domestic rubbish and commercial waste. Sizes start from 2 cubic metres, right through to sizes as large as 17 cubic metres. With high sides and a short length, the marrel tends to need an area of space that is roughly the size of a car parking space. The marrelbin is lowered down into its space. An access clearance area of 3metres is required and there must be no foliage, branches or wires in the way of the drop down area. Marrel skip bins can come with wheelbarrow access, however, please clarify if this is something you need in order to ensure that we deliver you the skip that meets your requirements. The hook lift skip bin is loaded on and off a truck by using a hook that grabs the skip, before rolling it off into the space it is designated for. Large rear doors that open and a rectangular shape make using a bobcat easy, and the size variation covering everything from 4m3 to 30m3 means that there is a hook lift skip to cover all waste requirements. Used primarily for commercial and waste disposal, the hook lift skip can be used for domestic waste, however it is relatively rare and they usually go hand in hand with the sale of an estate, or complete renovation, where the quantity of rubbish that needs to be removed would overloads a marrel skip. Mobile skip bins are great for people who need to get rid of waste in awkward places, such as under carports or offices that have an underground parking area. If you want to place a skip bin on property that is owned by the council, then a permit is required in order to ensure that you are acting within the constraints of the law. However, with a mobile skip bin, this permit isn’t required, saving you time and effort,as the mobile bin is a trailer that is registered to the road, the only cost you pay is the hire of the bin. You can use the bin to get closer to the source of your rubbish, and each skip comes with a lockable lid, meaning only you can use the mobile skip bin. If you need to get rid of waste that falls under other criteria, including soil, bricks, rubble, stones and concrete, then you will need to hire a bin that is specifically for these items. There is a weight limit in place on mobile skip bins in order to ensure all transportation is carried out safely, and you can choose from two sizes – 3 and 4 cubic metres, however there may be other size options available where stated.